(Nanowerk News) What lies beneath growing islands of graphene is important to its properties, according to a new study led by Rice University. Scientists at Rice analyzed patterns of graphene – a single-atom-thick sheet of carbon – grown in a furnace via chemical vapor deposition. They discovered that the geometric relationship between graphene and the substrate, the underlying material on which carbon assembles atom by atom, determines how the island shapes emerge. The study led by Rice theoretical physicist Boris Yakobson and postdoctoral researcher Vasilii Artyukhov shows how the crystalline arrangement of atoms in substrates commonly used in graphene growth, such as nickel or copper, controls how islands form. 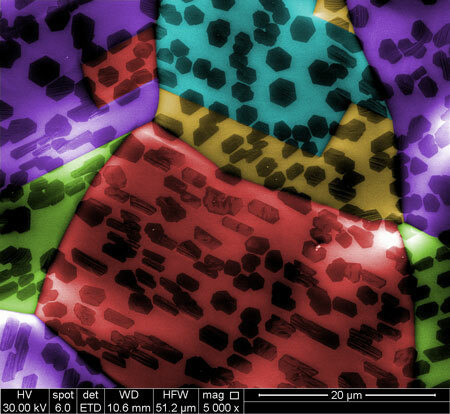 The results appeared today in Physical Review Letters ("Breaking of Symmetry in Graphene Growth on Metal Substrates").